I’ve pored over hundreds of adoption stories, good and bad, from the parent’s perspective. But rarely do we hear an adoption story from the now-grown-up child’s perspective. So, I asked my friend Francia to do an interview with me for this website. I met Francia quite a few years ago now, when she was still a teenager and I was also very young. Although we haven’t seen each other since, we’ve kept in touch somewhat through Facebook. (The advantages of social media!) Francia’s lovely personality is memorable, and her story of meeting her birth family is just as memorable. (I link to that story at the bottom of this interview.) 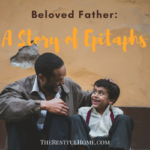 While her story is not necessarily a “feel-good” adoption story, it is a very real one that should provoke us to think through many facets of adoption and reconnection with our own families. Photo of Francia. Courtesy Francia’s Corner. Q: How old were you when you were adopted? How did you get connected with your adoptive family? I was seven years old. There was a lady in our neighborhood who had placed her child for adoption. Her dog helped protect me one night. Through her, my mother got connected to Reach out to Haiti, the adoption agency. Q. Do you consider your adoption a good thing? Yes and no. I will answer the no first. The no part is because I was old enough to know my biological family. I had been able to create a bond with my mother and siblings. Before my father passed away, I had an even stronger bond with him. Also, it traumatized me a great deal. Neither parents had sat me down to really explain to me what was going on. Q. Are there elements about your adoption that you wish had been handled differently? Yes, there are several things I would drastically change. First, I would have a conversation with the child if [he/she] were old enough. Okay, so I can see where some of you might see that as a bad idea. It might be. For me, it would have saved me drastically. I am already a bit different anyway, but I believe I would [have been] able to handle some things better. The other thing is for older children to spend time with the potential adopting parents. Even though I had already met my potential parents, it was not enough interaction. Q. Do you feel that you ended up with a good childhood? Again, this is a yes and no. No, because for most of my time with my adopted parents, I had very little interaction with the outside world. Even though I was adopted by “missionary and Christian” couple, my life was not very glamorous. They were very emotionally abusive. They were very strict and gave my two brothers and I very little room to grow and develop…Any little thing that they did not agree on was punished by depriving us of food, spankings, and standing in a corner for hours. Do not get me wrong; I believe in punishing bad behavior. [We were punished for] simple things like not washing the dishes properly. [We would be deprived of a] meal because we came in excited and slammed the doors on accident. When I got out on my own, I felt very unprepared for the world I was facing. I did not know how to do simple things like paying a bill, or how to search for apartments. Anything that would help me stand on my two feet. Q. What advice can you share with prospective adoptive families? If both parties can handle it, I would recommend an open adoption. Spend time with [the people to whom] you are giving your child. This might seem odd, but in the grand scheme of things my birth mother says she regrets not having spent time with my adopted parents. Q. What are you most grateful for? I am very grateful to be alive. I am thankful they gave me the opportunity of education and seeing part of the world. Francia. Courtesy of Francia’s Corner. Q. How did you get reconnected with your birth family? I have a cousin who was adopted a few years before I was. My sister reached out to him and asked him to find us. He was adopted [by] a French family in France. He found me on Facebook and connected me with my birth family. Q. I know you’ve written about some of the difficulties you’ve experienced since finding your birth family. What was the hardest part of meeting with them? For so many years I tried to wrap my mind around, “Why was I not good enough?” Growing up I have always felt abandoned, rejected, lonely, lost, confused, and not good enough. I was so busy trying to figure out who I was that I lost time [I could have spent] enjoying who I was becoming. In a way, it stalled my growth. I found no joy in my surroundings. I was always looking for something else. Now that I am older, I realize I was looking for answers. Q. What was the best part about finding them (your birth family)? In a strange way, I felt like I was found. All my searching for years to know where I belonged finally connected. It’s a silly concept, but I felt like I was just going in circles with my life. I had no real purpose but to find them. In fact, I had no real interest in what was around me but [in] where I was going. I have a long ways to go, but meeting them was just the first step. Q. How do you handle having multiple families? Honestly, I have not interacted with my birth family enough to [have] distinguished that. I feel like my adopted family is more my foundation. Q. How have you seen God’s work in and through your adoption? I have seen his work in many ways. So on how I view God…I have been angry and happy with him. Angry because there were so many tragedies in my life that have made me so confused. As a young child, I sought God to “rescue me” from some of the bad [things] I dealt with. As an adult, I see why He allowed them to happen. Q. Would you consider adopting a child in the future? Why or why not? Q. What does your life look like now? Good question! I currently live in Colorado and work as a toddler teacher. Children are easier for me to relate to than adults; I love children! [Perhaps I relate better with children because I] believe I am very socially awkward around adults. I believe I lack a sense of maturity from the emotional setback of adoption. In all honesty, I do not believe I have nor ever will get over how the adoption affected me. I love traveling. Seeing the world brings so much joy! My goal is to be a traveling blogger…I want to write and travel. Being a writer has always been a dream of mine and I am currently working on making that happen. I have written down most of my memories and plan on publishing a book. I am focused on developing as a writer and a better human being. Q. What advice do you have for others who were adopted as young children? Find your peace. If you experienced [the kind of] adoption I did, never give up! Through the confusion, there is a shred of peace that you can find to push you forward. I believe that emotional abuse is worse than physical. I have experienced several types of abuse and the emotional has done more damage to me than being physically beaten. For those of you who struggle: go to therapy or counseling. If that is not an option, find a strong, healthy confidante.